Pantheist was brought to life in the year 2000 by vocalist and keyboard player Kostas Panagiotou. Following various unofficial recordings, the ‘1000 Years’ demo was released in 2001, leaving its imprint on the underground, and in the process helping to solidify what is now known as Funeral Doom Metal. The demo so impressed Finland’s Firebox records that Pantheist was offered a recording contract straight away. The result was the release of ‘O Solitude’ in 2003. The band’s debut full-length album injected unusual and fresh elements in funeral doom such as orchestral arrangements, varied tempos, moods and dynamics. It is still hailed as a genre cornerstone today. As testament to the band’s ethos of hard work, they soon embarked on their first European tour (and first funeral doom tour ever) with Finnish doom stalwarts SKEPTICISM and label mates UNTIL DEATH OVERTAKES ME. They also toured with WHILE HEAVEN WEPT and MOURNING BELOVETH in the following year. A new chapter in the band’s history was opened following its relocation from Belgium to the UK in 2004. The band reformed itself showing much resilience and flexibility. That resilience was solidified with the release of the band’s sophomore album ‘Amartia’ and ‘The Pains of Sleep’ EP in 2005. Both releases were recorded at The Lodge Studios, owned and run by Robert John Godfrey (of 70s Prog giants THE ENID / BARCLAY JAMES HARVEST). ‘Amartia’ was the band’s first fully concept-based album, inspired by liturgical and religious themes, and ‘The Pains of Sleep’ further developed Pantheist’s increasingly progressive leanings, while simultaneously keeping a strong foothold in their underground sound. Both releases received worldwide acclaim and enjoyed overwhelmingly positive reviews, which were followed up with a number of highly successful European shows, including a headlining mini-tour of the Netherlands. 2008 saw the band’s third full-length for Firebox Records, ‘Journey through Lands Unknown’, recorded and mixed at Greg Chandler’s (ESOTERIC) Priory Recording studios. The result of 18 months of arduous work and serious musical and spiritual exploration, the album harked back to the more personal themes found in the band’s earlier material. Musically, it was the band’s most complex and layered yet accessible and engaging album; one which, in its daring stance towards genre boundaries and refusal to conform to expectations, managed to polarize opinion even further yet still reaped shining reviews and gained new admirers. The band’s reputation as a live act was further cemented with a number of shows around the UK and abroad, which culminated on a second and highly successful co-headlining tour with old friends SKEPTICISM and supported by OPHIS; a tour that ended in Berlin with a venue filled well beyond its capacity and several dozens of people standing outside and unable to get in. The band enjoyed their first foray into Eastern Europe in 2009, on a mini-tour of the Czech Republic and Poland in the company of Polish underground legends GALLILEOUS and Czech atmospheric doom heavyweights DISSOLVING OF PRODIGY. Both these bands were invited in turn to join Pantheist in a multinational doom metal gig in London, and the friendship between the three bands was sealed with the conceptual split album ‘Unveiling the Signs’, released in 2010 by Polish underground label Redrum666. To top off another busy year in the band’s history, Pantheist were also invited to co-headline the Moscow Doom Fest in 2010 with Esoteric. Pantheist’s fourth, a self-titled album, was released through Grau Records in 2011. True to their singular philosophy, the band continued to look ahead adding new elements to their music, this time exploring progressive rock themes as well as the occasional ‘pop‘ and ‘classic rock’ elements. Despite the daring changes, the band’s evolution has been likened to that of bands such as ANATHEMA and praised for its unrelenting drive to explore new pathways without losing sight of the basic ingredients of its earlier sound. The album led to a brief appearance in a UK Channel 4 TV show, a memorable and now legendary gig with Skepticism at St Giles in the Fields church in London (organized by the band itself) and a professional videoclip for the track ‘Be Here‘ filmed on location in Roeselare (Belgium) by young talented Belgian director Alexander Decommere. Several international shows were also completed alongside artists as diverse as CRIPPLED BLACK PHOENIX, IMMORTAL and ATARAXIE and Pantheist were featured very heavily in Zero Tolerance’s tribute to the anniversary edition of the Portuguese SWR festival, where the band performed in 2012. 2013 was met with more gigs while Pantheist continued writing their fifth album. The band played in Greece as well as at the Doom Over London edition of that year. Some line-up changes then led to a temporary hiatus where the band took the time to reinvent itself and review its past, decidedly focusing on its doomy and heavily ritualistic side. The band hit the stage again in 2015 after a two-year absence from live stages headlining the Doom Over Kiev festival in a bill featuring ANTIMATTER and KAUAN among others, where several new tracks from the upcoming album were introduced to an enthusiastic audience. 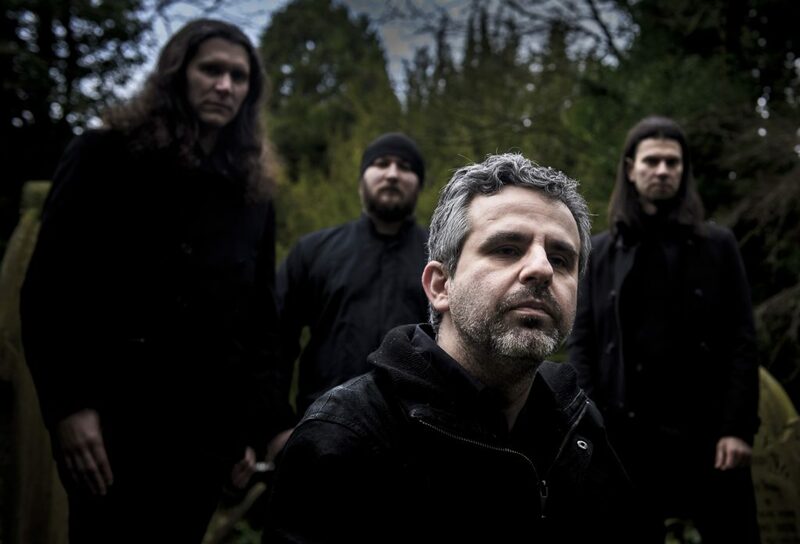 2016 found Pantheist working on their fifth album, while playing carefully selected gigs at festivals in London, Edinburgh and Bucharest between writing sessions. After one more gig in early 2017, the band concentrated on delivering their long-awaited fifth album. Bearing the title ‘Seeking Infinity’ the album is due out on the 14th September 2018 by Melancholic Realm Productions (CD) and The Vinyl Division (LP). True to its philosophy, this is once again a very different undertaking than those in the past; the band’s second conceptual album after ‘Amartia’, it is based on a story written by founder Kostas Panagiotou, which is accompanied by its own soundtrack, consisting of collaborations with various external musicians and artists. That soundtrack was released in the autumn of 2016 by Kostas Panagiotou as a solo fundraising EP entitled ‘Chapters’. ‘Seeking Infinity’ is a return to the band’s funeral doom roots, while still encompassing many elements of previous albums that have shaped Pantheist into a force to be reckoned with in the doom metal genre.